Fall is one of our favorite times in Washington DC. The heat and the crowds are gone, so you can enjoy the best of the city. Here are a few of our favorite things to do in October. Enjoy the fall foliage along the C&O Canal National Historic Park starting in Georgetown and stretching for 13 miles to Great Falls Park in Northern Virginia. Explore Rock Creek Park – a park in the middle of the city offering walking, jogging and bike trails – even a stable. Visit the US National Arboretum and enjoy the Orchid show and sale or just take a walk around the grounds and enjoy the fall foliage and the seasonal blooming plants including hibiscus, autumn crocuses, water lilies, camellias, chrysanthemums, boxwood and more. Take a walk at the National Zoo in the crisp fall weather (and maybe even smaller crowds). Visit the National Zoo the evening of October 21, 22 or 23 with Boo at the Zoo and get treats and see the animals at night. Take a walking tour and visit Washington’s most haunted houses including the Octagon House. Looking to celebrate Oktoberfest? The Post’s Going Out Guru’s recommend the best in DC including Beirgarten Haus. For German culture, including film, games and yes, Oktoberfest, visit the Goethe Institute. Check out our specials and make your reservations now. We’ve had an exciting week in Washington DC – experiencing our first earthquake in over 100 years and awaiting the arrival of Hurricane Irene. All scheduled events for Friday will continue as planned including the Partners In the Dream MLK Store and the Women Who Dare to Dream Luncheon, both being held at the Washington Convention Center. The last official event of the Dedication Week will be the National Prayer Service that will be held on Saturday at the Basilica on the National Shrine of the Immaculate Conception. Please note that the Prayer Service was moved to the National Shrine from the National Cathedral. The National Park Service will open the Memorial to the public on Saturday from 7:00 am until 12:00 noon, weather permitting. The official dedication that was to be held on Sunday will be postponed to a later date in the fall. An official announcement will be made by the MLK Foundation once a date has been confirmed. For more information, please visit www.dedicatethedream.org. In support of the Martin Luther King Memorial Foundation, the Hamilton Crowne Plaza Hotel is donating 10% of room revenue to the MLK Foundation for rooms booked from August 18, 2011 through the end of the year. The MLK Memorial Foundation will dedicate the Martin Luther King, Jr. National Memorial in West Potomac Park along the Tidal Basin in Washington, D.C. on Sunday, August 28, 2011. For more information regarding the Martin Luther King, Jr. National Memorial and the Memorial Foundation, visit the website: www.mlkmemorial.org. If you would like to attend the special ticketed ceremony, the Hamilton Crowne Plaza has a limited number of reserved tickets available for guests staying at the hotel. The donation will be made based on the room rate reserved and booked directly through the hotel’s website using rate code ID 100289014 for stays now through December 31, 2011. If you’re planning a trip to Washington DC, you probably have visions of trips to the Capitol, the Smithsonian, the Washington Monument and the National Zoo dancing through your head. But what if the government, who runs these museums and monuments, shut down for a short period of time? Due to a budget showdown, this could be the reality in the coming weeks. But there’s no need to panic – there’s still plenty to do in Washington that doesn’t depend on the government. While you wouldn’t be able to enter any monuments (the Washington monument, the Lincoln memorial, etc. ), the National Mall and the Tidal Basin are still available to walk around. The Washington DC World War I Memorial (behind the World War II Memorial on the Mall) is open. The Smithsonian museums aren’t available, but Washington boasts plenty of other museums that offer enjoyable experiences for adults and children alike. Adopt a cover and go on a daring mission at The International Spy Museum at 800 F Street NW. You’ll go through the Spy School, the Secret History of History, and learn about Spies Among Us. Explore the America I AM exhibit , The President’s Photographers exhibit or the Great Migrations photography exhibit at the National Geographic Museum at 17th & M Streets. The National Building Museum at 401 F Street NW offers great exhibits for kids including LEGO Architecture: Towering Ambition. Shake hands with all 44 presidents of the United States and see civil rights figures such as Martin Luther King and Rosa Parks at Madame Tussauds wax museum at 1001 F Street NW. Walk onto the actual television set of America’s Most Wanted and a CSI crime lab at The National Museum of Crime and Punishment. Connected to the Corcoran School of Design, The Corcoran Gallery of Art at 500 17th Street is a short walk from the hotel and has a strong collection of American art including John Singleton Copely, Frederic Church, Mary Cassat, Winslow Homer and Edward Hopper. Located in Dupont Circle, The Phillips Collection is best known for their French Impressionists including Renoir’s Luncheon of the Boating Party. Every Tuesday, Wednesday, Thursday and Friday at noon the Collection offers a 15 minute “Spotlight Talk” focusing on one work in the museum. The National Museum of Women in the Arts at 1250 New York Avenue NW offers a permanent collection dedicated to works by women from the 16th Century to the present, from Renaissance paintings of Elisabetta Sirani to Irish and English women silversmiths to contemporary sculptures and paintings. Hillwood Museum and Gardens is the home of Post cereal fortune Marjorie Merriweather Post. Post was also married to E.F. Hutton and US Ambassador to the Soviet Union Joseph Davies. During her time in the Soviet Union she collected Russian decorative and liturgical arts including many Faberge eggs. The house and grounds at 4155 Linnean Avenue NW are a great way to pass an afternoon. Check the calendar for family events. The Kreeger Museum is a private, non-profit museum on Foxhall Road in Georgetown. The Kreeger’s collection contains nine Monets as well as works by Renoir, Sisley, Pissarro and Picasso. They frequently host chamber music concerts. While you won’t be able to tour the Arlington National Cemetery, the Historic Congressional Cemetery at 1801 E Street SE, the final resting place of Representative Tom Lantos, the only Holocaust survivor to serve in Congress; John Phillip Sousa, the “March King”; J. Edgar Hoover, longtime director of the FBI; and Eldridge Gerry, only Vice President to be buried in the District. There is a self-guided walking tour available, plus a docent-led tour each Saturday at 11 a.m. In addition, a special Civil War tour is offered on the third Saturday of each month at 1 p.m.
Lincoln spent nearly a quarter of his presidency at a cottage in upper Washington as he pondered the decisions he needed to make. You can tour Lincoln Cottage near the Old Soldier’s Home. Visit the Lincoln exhibit at Ford’s Theater. Check the Calendar for “History on Foot” walking tours reexamining the clues of Lincoln’s assassination. Remember too that most of Washington DC’s history is in the neighborhoods, not in museums. Walk down U Street and follow the DC Neighborhood Heritage Trail. The first market is located at 13th & U Streets. Learn more about the history of Washington’s African American community while you walk through a revitalized neighborhood full of shops and restaurants. Be sure to stop by Love Café and DC institution Ben’s Chili Bowl – even the President has been known to stop by here. Spring has officially arrived which means the Cherry Blossoms won’t be far behind. An annual tradition in Washington, the Cherry Blossom Festival will have a different feel this year in light of recent events in Japan. The cherry trees were a gift from Japan in 1912. The first lady and the wife of the Japanese ambassador planted the first two cherry trees along the Tidal Basin. The traditional Sakura Matsuri festival on April 9 at 12th & Pennsylvania Avenue will charge a $5 admission fee for the first time, with a portion of the fee donated to earthquake relief efforts. On Thursday, March 24, there will be a walk around the Tidal Basin to remember those affected by the earthquake. The walk will start at 6:30 pm south of the Washington Monument near the Sylvan Theater. The Cherry Blossom 10 Mile / 5 K is scheduled for Sunday, April 3. The race is sold out well in advance, so if you haven’t already signed up, you should make plans to cheer on the runners. If you are running, consider staying downtown with us to avoid Metro delays on race day. Post-race or anytime during the festival stop by the patio at 14K Restaurant for cherry-themed drink specials and dishes. The National Park Service offers a variety of special Cherry Blossom related daily activities around the Tidal Basin including Ranger-led talks. 3.5 mile runs, bicycle tours, lantern walks, and a junior ranger activity tent for children 6-12. 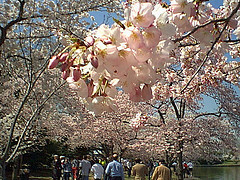 The festival closes with the Cherry Blossom Parade on April 9 down Constitution Avenue. You might not always think of Washington DC to bring out the Christmas spirit, but there’s plenty going on here to make planning a special trip worthwhile. If you have a free weekend during the holidays, come see what we have to offer (and it’s more than our special rates). Pageant of Peace – Each year the President attends the lighting of the National Christmas Tree Ceremony in the Ellipse behind the White House. This year’s celebration is scheduled for Thursday, December 9 and includes a concert as well as the tree lighting ceremony. Nightly concerts continue throughout the holiday season. Holiday Pops – A perennial favorite, the National Symphony Orchesta’s Happy Holidays concert conducted by Marvin Hamlisch includes a sing-along, a Hanukkah song written by Marvin for the occasion, and a host of special guests including Saint Nick himself. The Nutcracker – The Washington Ballet’s version of the Nutcracker at the Warner Theater casts George Washington as the heroic Nutcracker and England’s King George as the Rat King and has quickly become a Washington holiday tradition. NPR’s Jazz Piano Christmas – on Saturday, December 11 at the Kennedy Center for the Performing Arts brings out top jazz artists to perform their favorite holiday songs. The program is recorded for broadcast on NPR. The National Gallery of Art offers free concerts in the West Garden Court of the West Building on Sunday evenings. The December schedule includes the Jakov Kakoulov and other Jewish composer, Christmas Carols and a Holiday concert including music by Johann Sebastian Bach. Washington National Cathedral offers Holiday concerts including The Joy of Christmas on December 11 & 12. Hanukkah begins December 1 and the National Menorah will be lit on the Ellipse near the White House. Enjoy ice skating in the Sculpture Garden at the National Gallery of Art. Weather permitting, the rink opens in mid-November. Skate rentals are available for $3, and a two-hour skating session is $7 for adults and $6 for children and seniors. ZooLights – the National Zoo’s annual winter celebration when they light up the Zoo and stay open after dark, offering special keeper talks and live entertainment runs December 3 – January 1. The first national science festival is coming to Washington on October 10 – 25. The two day science expo is scheduled for October 23 & 24th on the National Mall from 10 am to 5:30 pm. This is a perfect chance to bring the kids to Washington, get outside and enjoy the National Mall and see how much fun science can be. Events around the DC area during the festival include science-themed events including star gazing, a school garden tour, a Rubik’s cube tournament, and science-themed comedy. See a complete list of festival events. See a complete performance schedule for the weekend Expo. Discover a list of science fair projects and experiments you can do at home. Plus while you’re visiting Washington DC, you can visit the National Museum of Natural History, the National Zoo and the Koshland Science Museum of the National Academy of Sciences. August is a great time to visit Washington. There’s less traffic as many Washingtonians head to the beach plus lots of cultural events designed for summer travelers. Legg Mason Tennis Classic – See top tennis players including Andy Roddick, John Isner, and Radek Stepanek play at the William H.G. FitzGerald Tennis Center in Rock Creek Park July 31 – August 8. Restaurant Week – try some of Washington’s best restaurants at a discount August 16 – 22, including our own 14K restaurant. Special 3 course menus are $20.10 for lunch and $35.10 for dinner. Mary Poppins at the Kennedy Center – any visit to Washington DC should include the free tour of the John F. Kennedy Center for the Performing Arts, and this August you can also see the hit Broadway musical Mary Poppins through August 22. Remember that the Hamilton Crowne Plaza is a pet friendly hotel – we welcome your traveling companion. So do many of the local restaurants with outdoor seating areas including Blue Duck Tavern and Zatinya. A common question we get from guests – especially repeat visitors – at the Hamilton Crowne Plaza is where to find the “real” or “hidden” Washington DC. Here are a few of our secret treasures that most visitors to Washington never see. Home of the Smithsonian’s American Art Museum’s craft and decorative arts program, the Renwick is located near the White House at 1661 Pennsylvania Avenue. A current exhibition features furniture, toys and games made in the Japanese American Internment Camps during World War II. Located at Gallery Place Metro, the National Portrait Gallery is another Smithsonian Museum that is often overlooked. The Gallery housed in the old Patent Office Building and was completely restored in 2000. Visit the Kogod Courtyard for a moment of peace, a snack or free Wi-Fi access. In the middle of Georgetown on M Street, you’ll find the oldest standing building in Washington DC – Old Stone House. Built in 1765, the house is constructed of local granite and is open Wednesday – Sunday from noon – 5 p.m.
A private art collection in Dupont circle, the Phillips Collection offers nearly 3,000 works by Degas, Cezanne, Gauguin, van Gogh, Matisse, Picasso, Calder, Rothko and more including Renoir’s Luncheon of the Boating Party. On the first Thursday of each month, the Phillips hosts Phillips after 5, combining live jazz, gallery talks, art and a cash bar. Philips after 5 are popular events and reservations are encouraged. On a twenty-five acre estate of formal gardens, the Hillwood Museum is the former home of Post cereal heiress Marjorie Merriweather Post. She was also married to both E.F. Hutton and American Ambassador to the Soviet Union Joseph Davies. During her time in the Soviet Union, she acquired Russian imperial art including a large collection of Faberge eggs that are on display. Hillwood is located at 4155 Linnean Avenue, just off Tilden Street, about a 20 minute walk from Van Ness UDC Metro Station. Take Metro to Stadium Armory and switch to the B2 Metrobus. Get off at Rand Street, just past the Arboretum sign on the right. It’s a 2 block walk to the Arboretum entrance. Given to Harvard by Mildred and Robert Woods Bliss, Dumbarton Oaks Library, Museum and Garden offers a haven for Washingtonians, visitors and scholars. The highlights of the museum include both the Pre-Columbian and Byzantine collections including a large number of Byzantine coins and seals. The gardens are open daily except Mondays from 2 – 6 pm and introductory tours are available at 2:10. Spy tours from the Spy Museum that depart from Union Station and focus on famous espionage stories in Washington DC. Georgetown has a variety of free walking tours focused on spies, ghosts, celebrities and more. Lincoln’s Assassination walking tours follow in the footsteps of the president and his assassin. The Washington Post offers several scandal tour options based on recent (and not so recent) events.